"I use El Capitan and iPhone 7 with iOS 11. Photos I take with my iPhoto will not import into PHOTOS on my iMac. While the thumbnail appear, an alert exclamation is all I get. Only started with IOS 11!!" – from Apple Forum user. Not only iMac, iMac Pro and MacBook (Air/Pro) shipped with older operating systems can't open iOS 11/12 iPhone HEIC photos. And the only way to open HEIC images on Mac with the native Photos app is to upgrade your Mac OS to macOS High Sierra/macOS Sierra 10.13 or macOS Mojave which powers itself with the ability of HEIC support, otherwise, you need the help of third-party HEIC viewer and HEIC converter. How to Open iPhone HEIC Photos on Mac? Mac OS X, macOS Sierra & macOS High Sierra and Mojave compatible. What is HEIC? Why HEIC Photos Won't Open on Mac macOS Mojave? HEIC or HEIF (High Efficiency Image File), developed by the MPEG group, is the newly image format that Apple adopts in iOS 11 to replace the standard format JPEG, for its great ability to save twice as much as information comparing the JPEG images with the same size. That is to say, 1000 HEIC/HEIF photos will take the rough size of 500 JPEG photos on your iPhone now. iPhone HEIC photos can be only taken with iPhone XS (Max)/XR/X/8 Plus/8/7 Plus/7, iPad Pro and iPad 9.7 shipped with iOS 11/12 as of now, and it is officially claimed that macOS sierra 10.12.5 or lower has no ability to support HEIC. Obviously, it is not hard to see that is the Apple's usual tendency to make their older systems obsolete. So, you need to correspondingly upgrade your Mac to the new version (macOS High Sierra 10.13) if you want to open iOS 11 iPhone HEIC photos on Mac with pleasure. But what if you want to open HEIC photos on Mac without upgrading your Mac OS, how can you view HEIC photos? How to Open iPhone HEIC Photos on Mac macOS Mojave included? There is a good way to help you out. DearMob iPhone Manager, following the new trend of Apple, will enable you to preview HEIC/JPG/PNG pictures and transfer HEIF/HEIC photos from iPhone to computer as JPEG to be opened by Mac Photos as well as Windows Photo Viewer. No more HEIC won't open on Mac or HEIC can't open on Windows problems, you can handle HEIC photos on computer at will now. Step 1: Click the download button below to download this HEIC photo manager, install and launch it on your Mac. Step 2: Connect your iPhone and Mac with USB cable. If there is a message on your iPhone asking you to trust the computer, just tap Trust to continue. Step 3: View the HEIC photos with this HEIC photo manager. DearMob iPhone Manager allows you to preview the HEIC photos on Mac before transferring. Step 4: Click on Export icon to transfer HEIC to Mac as jpeg to view with Photos app without HEIC won't open on Mac issue any more. Since this is the first time that HEIC is used as the photo format by Apple, and would be a new trend to replace JPEG in the near future, it's no wonder that HEIC won't be opened by most applications on Mac or Windows at present. Apple knows it as well and many software developers also have started to follow this tendency. So, there are some other feasible ways for you to tackle can't open HEIC photos on Mac/Windows problem well. After your iPhone 7/7 Plus upgrading to iOS 11/12, you can make your shoot JPG again by opening up your iPhone's Settings -> Camera -> Formats -> select Most Compatible, and then the photos you take with your iPhone 7/7 Plus will be in JPG format which could be opened on Mac. 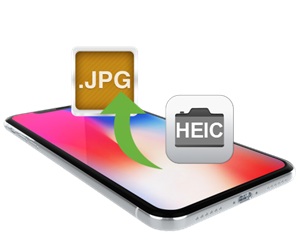 Or use the built-in JPG converter of iPhone to convert HEIC to JPG: Settings -> Camera -> Format -> select Automatic in the Photo tab under "TRANSFER TO MAC OR PC" and then the HEIC photos on your iOS 11 iPhone X/8/8 Plus/7 Plus/7/iPad Pro or iPad 9.7 will be transferred to Mac/PC as JPEG. As Photos app on Mac powered with macOS sierra 10.12.5 or lower and Windows Photo Viewer can't open HEIC photos at present, help coming from third-party HEIC photo viewers would be your another choice to open iOS 11/12 iPhone HEIC images on computer. Such tools include Apowersoft Photo Viewer, iMyFone Photo Viewer and CopyTrans HEIC for Windows. Email can also realize the auto conversion if you only have one or a few HEIC photos to be converted, but a HEIC converter like iMazing HEIC converter allows you to batch convert hundreds of HEIC photos as long as you have transferred HIEC photos from iPhone to computer with a certain tool like DearMob iPhone Manager ↓↓↓. Besides, coverting HEIC to other formats with a HEIC converter will loss some image quality to some extent, and you will lose Portrait mode after converting as well.